Eleanor “Elle” Chance, that is—a high-flying dirigible pilot with a taste for adventure and the heroine of this edgy new series that transforms elements of urban fantasy, steampunk, and paranormal romance into pure storytelling gold. First of all, let me get this out of the way. I freakin' loved this book! The blend of steampunk and paranormal was magnificent! Now that is out of the way, on to the review. A CONSPIRACY OF ALCHEMISTS is Ms. Schwarz's debut novel yet she has already mastered the craft of world building and characterization. I had not an issue one with placing myself along side Elle and Marsh as they go harrowing off trying to rescue a stolen item. We travel from Paris to England to Venice and onto Constantinople as we experience both the best and the worst of what the far flung cities have to offer. There isn't a dull moment to be found between the danger that lurks at all around them and the witty dialogue between the characters. Elle is definitely a unique woman for that time and Marsh really learns to appreciate her as time rushes by. 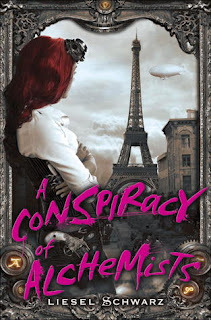 I highly recommend A CONSPIRACY OF ALCHEMISTS to my readers that both enjoy steampunk and the paranormal. It is one wild ride that is sure to please. I rate this book a 4.7.